While the Bible, plainly read, argues for an early-date Exodus c 1446BC, some scholars claim that there is a lack of archaeological evidence to support this, and prefer to put the Exodus at a later date of c 1270BC. Regardless of the date of the Exodus, several events are not in dispute: a) The date of construction of Solomon’s temple in 966BC. b) The ~120 years for Saul, David and Solomon’s combined reigns; and c) the 40 years of wilderness wanderings immediately after the Exodus. The only variable is the time-span of Joshua and the Judges. The late date (1270BC) was chosen due to the length of Ramses’ reign (one of two pharaohs that ruled for over 40 years – the time Moses was in wilderness exile) and evidence of battles in Palestine dating to ~1230BC (Joshua’s conquest after the wilderness wandering). 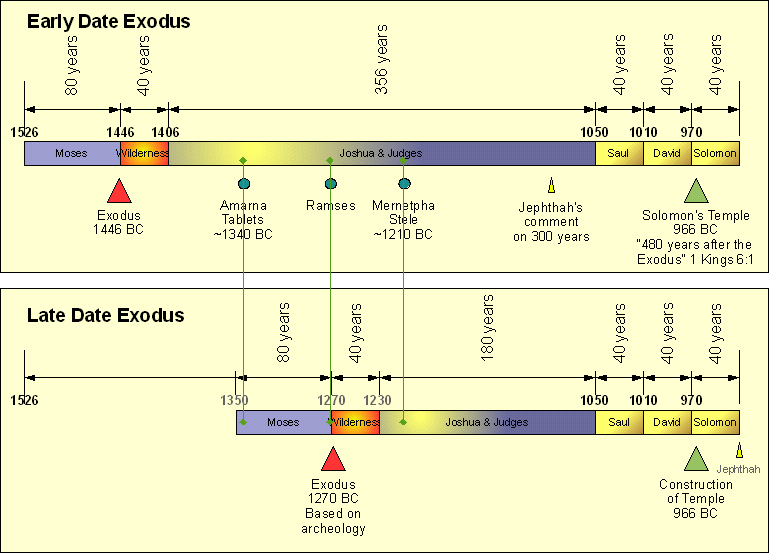 However, the late-date Exodus allows only 180 years for Joshua and the Judges, while the early-date Exodus, allows 356 years. There are several benefits to the earlier date. 1. I Kings 6:1 states the Exodus took place 480 years before the construction of Solomon’s temple began. (Some scholars spiritualize this to mean 12 tribes x 40 years of trials. This lets them use the 1270 BC date.) Thutmose III’s 60+ year reign makes him an ideal candidate as the pharaoh of the oppression, and his son Amenhotep II as the pharaoh of the Exodus. 2. In Judges 11:26, Jephthah states that the Israelites had possession of the land for some 300 years. With a 1270BC Exodus, he would had to have made that statement during Solomon’s reign. Naturally, this scenario is untenable as Jephthah lived long before Solomon (or Saul, for that matter) was born. 3. Even allowing for a possible overlap of the reigns of the judges, the activities and times specified in the book of Judges don’t compress well into a 180-year time-span. 4. The Merneptah Stele is dated to approximately 1210BC and states that the nation of Israel was destroyed by Pharaoh Merneptah. With a late-date Exodus, Joshua would have had less than 20 years to establish the nation of Israel in time for Merneptah to destroy it. Twenty years is simply too short a span of time to build up a nation worthy of military conquest. 5. Pharaoh Seti I, Ramses II’s father (Merneptah’s grandfather), made reference to a group of people apparently called ‘Asher’ that occupied the same region as the Israelite tribe of Asher. If these groups are one and the same, this argues strongly against the late-date Exodus. 6. The Amarna Tablets’ reference to the ‘habiru’ coincides well with activities of the Israelites while they fought to establish their territories. 7. The Ipuwer Papyrus describes events strikingly similar to the Ten Plagues. It’s dated c 1600 – 1400 BC. 8. We know from Egyptian history that Amenhotep II was not the oldest son of Thutmose III. This would explain his survival during the Tenth Plague where all the firstborn died.